Why Nokia’s OVI Store has the potential to beat the Apple App Store? Being true to the rumors, Nokia today announced its own App store, termed the Nokia Ovi Store at the Mobile World Congress in Barcelona. Even though Nokia got into the game pretty late compared to rest of the competition, it has a pretty good chance of even beating the Apple App store. Now most fan boys would start to argue that I probably wrote this article after taking down a couple of bottles but a look into the facts may very well change your mind. Despite the recent drop in sales, Nokia is undoubtedly the biggest cellphone maker in the industry, with a market share of over 38 percent. In comparison, Apple has only managed to capture 1% of the total market (which was its plan by the way). 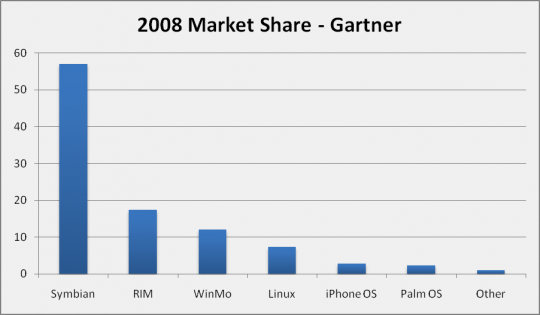 If you compare by platform, Symbian devices dominate half of the market with a 57 percent share, compared to a mere 2.8 percent of Apple. 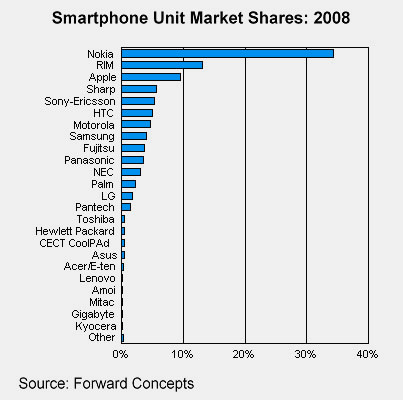 Note that these figures also include Symbian devices from other manufactures like Sony Ericsson and Samsung. A major reason for the popularity of the Apple App Store was its revenue sharing model; 30 percent of the revenues from a product sale go to Apple while the remaining 70 go to the developer. The developer could also opt to sell the application for free, and wouldn’t have to pay anything to Apple per download. Nokia seems to be following Apple’s proven formula and is also offering the 70/30 revenue sharing model. But why would Symbian developers let go of their existing business model and opt for only 70 percent of the total revenue? The answer is simple; they can reach a wider audience because it is a hell lot more easier for the end user to just browse a single catalog instead of visiting a hundred stores. On top of that, Nokia Ovi Store has some very intuitive features like built in Social Networking and Location Based Services, further promoting the sale of the applications. The Ovi Store would offer services which include Ovi Music Store, N-Gage Gaming Service, Ovi App Store, Mashable Widgets and Nokia Maps. Think of it as iTunes, App Store and Google Maps combined with a couple more services. Though this doesn’t necessarily mean that it would do better than these individual services. The real killer features of Ovi would be the built in artificial intelligence and the social networking features. The service would know what your friends and contacts are buying (or downloading) as well as feature reviews and suggestions from them. It also has a built in recommendation system that would learn your taste over time and organize and offer content accordingly, kinda like the Genius Music Recommendation system from iTunes. The selection of applications also vary depending on your current location. During the demo at the Mobile World Congress, most the content shown in the Ovi Store was targeted towards Spanish users. 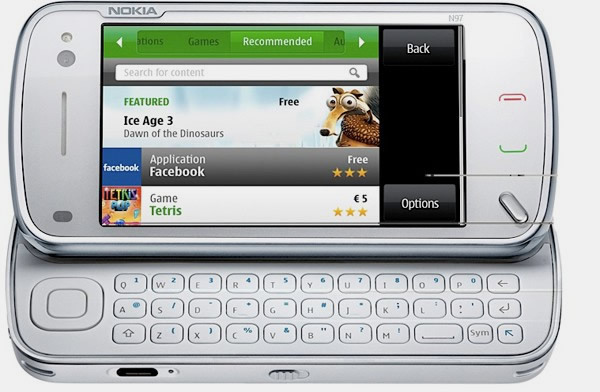 The N97 would be the first handset to have the Ovi Store pre-installed when it is released this June. But Nokia’s biggest shot at market dominance lies in the fact that they would have the Ovi Store download-able and running on “tons” of Series 40 and Series 60 devices starting from may. Now how will they manage Application compatibility between these platforms is a major issue or they would just leave that out to the developers to choose the compatible devices. The Ovi Store has all the ingredients for success built right into it along with big name launch partners already signed including Facebook, MySpace, EA, Qik and a lot more. After all these facts do you still believe that Apple’s App Store still has a chance? Ran 21 queries in 0.485 seconds.